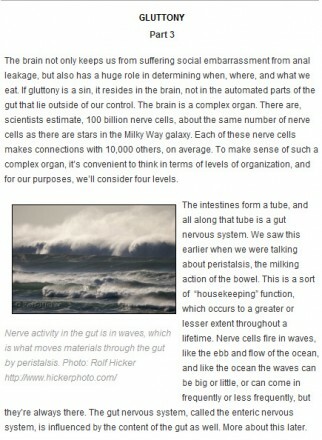 In Part 1 of “Gluttony”, we set up the concept of Seven Deadly Synapses the book. In Part 2, we looked at how an Oreo cookie is broken down and ends up either becoming a part of us, or being released in the toilet. In Part 3, we looked at our motivations for eating, and how they might be altered by chemicals made by our bodies, or even chemicals coming from hitch-hiker microbes. In this Sunday’s installment, we’ll talk about how our genes may be driving the process of gluttony. Before the revolution in gene sequencing of the last three decades, which culminated in the Human Genome Project, the main way for genetic researchers to study disease was to catalog and sift through the spontaneous mutations that arose in laboratory mice. For years now, to make genetic research possible, different strains of laboratory mice have been inbred for hundreds of generations. Now, each individual mouse of a strain is essentially an identical genetic copy of its father and mother, a duplicate of its cousins and siblings, and the original from which its unborn descendants are copied. For example, a kind of shiny black mouse called “C57Bl” is an inbred strain; all mice of this type are genetically identical, except for mistakes and random changes made in the copying process. In one of these mutations, mice begin to get fatter and fatter starting at about four weeks of age, about the time the mice reach sexual maturity. As adults, they’re grossly obese, barely able to move around their cages. Genes are named with a short designator, and since there are two copies of each gene, one from the mother and one from the father, the names of the two gene types are separated with a slash. Because of this obesity, mice that carry two copies of the mutation that makes them fat are called ob/ob mice.